The Hotel Cailler in Charmey offers 61 no-smoking rooms, junior suites, suites and apartments. 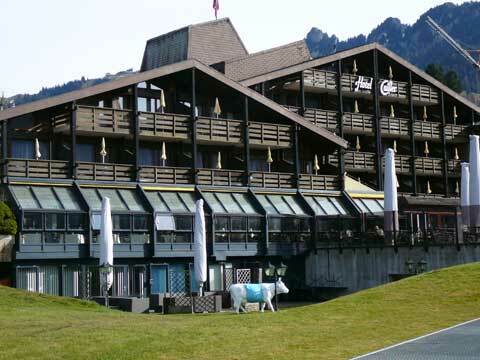 The hotel name is based on the Cailler chocolate brand, one of the older chocolate factory in Switzerland that you can visit in Broc, a five minutes drive away from Charmey. The hotel has two restaurants: Le Bistro and les Quatre Saisons. Le Bistro has a brasserie-inspired menu, enriched with regional specialties and cheese-based dishes like the famous fondue. The Quatre Saisons is a gourmet restaurant with white tablecloths and outstanding service. It offers meat and fish dishes that vary according to season. The hotel is located in front of the Gruyere Thermal Baths of Charmey. This large spa complex that offers swimming pool, sauna, hammam and 16 beauty care booths with a view on the Swiss Alps.